2018 CAA Football Third Team Offense. 40 rec – 605 yards – 15.13 YPR – 6 TDs. Jimmy Moreland or DeAndre Houston-Carson. Are you listening to music before a game? If so, what? I’m probably listening to a Motown collection. I have to take a bubble bath with epsom salt the night before to relax my body. My role model would be my father. I have seen him go through so much stuff in his life and not one time complained. Just does his job as a man and provides for our family. You are a Kinesiology major. What made you pursue that subject? I would go to physical therapy with my dad when I was younger and watching how those people were so involved with trying to successfully help men and women get over injury it, it excited me. I love helping people and I love sports, so this is the perfect balance. Favorite class would be Biocultural Anthropology and least favorite Art History. What made you choose William & Mary? I felt like if I was to get a degree from such a great school it would help me setup my future endeavors after football. When I apply for a job, the employer would see that I graduated fro here and understand how I much I wanted to achieve the best in my life. My cousin also went here B.W. Webb and I saw exactly how the coaches were and knew it was a perfect fit. Meeting my girlfriend, Robyn. She has showed me so many great things in life and taught me to not take things for granted. Growing up I’ve always loved the New Orleans Saints. My favorite player is the Original X factor Dante Hall. He was so elusive and explosive. His ability to stop and go on the drop of a dime was unmatched. He could change the momentum of a game in a second if the ball was in his hands. Malcolm X. He was someone who helped changed the world we live in today. Not many people understood him and I would like to pick his brain. If people aren’t willing to listen make them hear you. The Flash. Growing up I always had a thing for speed. Whether that is fast cars,planes, and even people. My mom always talked to me about Michael Johnson “the fastest man alive” I wanted to be him. Speed is something that really intrigued me. Hard work to me is doing what you have to do in order to do what you want to do. What are you doing to set yourself apart from the other people trying to achieve similar goals. To take every day one day at a time. Things change and you have to be on your toes. Go with your gut. You know what is best for you. Why do you wear #11? I was given it my freshman year even though I wanted #5, but I decided to keep it. What is the best part of your hometown, Williamsburg, VA? The people. Everyone is family and everyone looks after one another. LeBron because he does everything from scoring, rebounding, assists, defense. It is clear that he knows the game inside and out and he makes others better simply by being around them. Xbox One. I have been playing Call of Duty and 2K. Beating JMU on Halloween. I didn’t do much that game stat wise but the coaches noticed that I was willing to get in and do what was needed to win the game. Stop my family from struggling. Spread peace and love in the world. For a successful and healthy career, no matter what I may do. My ability to make people laugh. If there is a book written about DeVonte Dedmon, what is the title? Take my family on a vacation. Sit and listen to music. If you could catch a TD from any NFL QB, past or present, who would it be & why? Michael Vick because he showed the guys in the area that there is more to life than living in the streets. 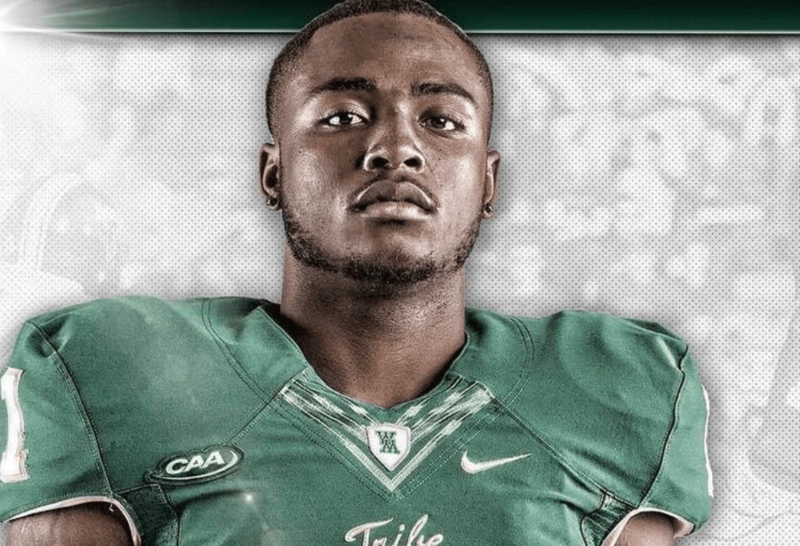 What are three words to give NFL scouts that define DeVonte Dedmon? Seeing the little kids on the sides of my games because I remember being that kid. I always wanted to be someone kids can look up to.